Grid parity has grown to become quite the buzzword in the renewable energy community. Indeed, as shown below, the latest estimates from the International Renewable Energy Agency (IRENA) shows that onshore wind is already at grid parity with fossil fuel electricity and that solar might be at grid parity in certain select regions by the year 2020. This is sure to warm the hearts of many renewable energy activists. After all, when renewable energy reaches grid parity, we will finally see this “disruptive change” we have heard so much about. The curious thing is that even onshore wind still requires substantial subsidies in order to be deployed. From the IEA data below, it is clear that onshore wind still received $21 billion in subsidies in 2011. Given that wind generated 437.4 TWh in 2011 (BP data), this amounts to an average of $0.048 per kWh – about 50% of current OECD fossil fuel electricity prices. If all electricity received this amount of support, it would cost more than a trillion dollars per year. Following the same methodology, solar PV received an average of $0.47 per kWh in subsidies in 2011 – a whopping 500% of current OECD fossil fuel electricity costs. Yes, it is true that solar PV prices have dropped substantially in recent years, but, as shown below, very little of this drop has been due to technological advancements. The bulk of the price drop has been due to margin erosion where companies have been kept afloat through various forms of government support and desperate cost cutting across the board. Given this very unhealthy business environment, the recent reports of a large increase in defective PV panels should come as no surprise. Even though it is conceivable that solar PV could eventually achieve grid parity with fossil fuel electricity through third generation technologies like organic PV, the chances of first generation panels (for which an enormous overcapacity has been subsidized into existence) ever achieving this milestone are slim to none. 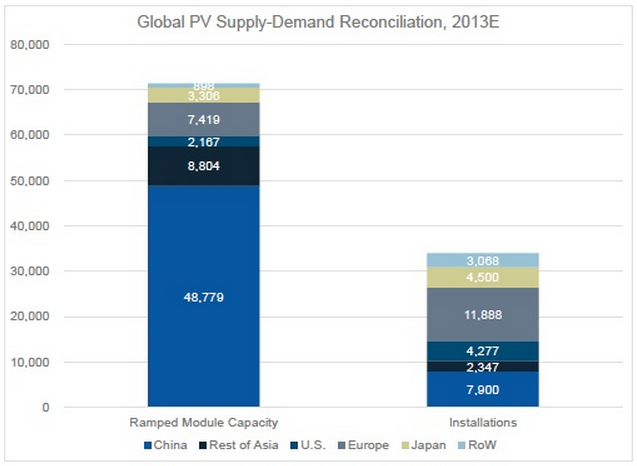 When the dust finally settles, this enormous first generation PV overcapacity will probably go down in climate change history as a deeply regrettable malinvestment. But even if solar PV eventually achieves grid parity with fossil fuel electricity, onshore wind has proven that nothing (certainly nothing disruptive) will happen without the continuation of generous government support. There are many good reasons for this (discussed previously), but the intermittency issue is probably the most important of these. Wind and solar power automatically cover the first point because they generate electricity directly. This is a very good thing and certainly counts very much in the favour of these technologies. When it comes to the second point, however, wind and solar become much less attractive. Fossil fuels are different in that they cover the second point very well (built-in chemical energy storage), but fail to meet the first point. It therefor becomes clear that, while fossil fuels require expensive and exergy-leaking additional infrastructure to deliver highly refined energy to society, renewables require expensive and exergy-leaking additional infrastructure to deliver on-demand energy to society. As a simple example, imagine that you could choose between $5000 of solar PV (about 2 kWp) and $5000 of coal (about 50 tons containing roughly five times the energy the PV will generate in 30 years). Under the constraint that you could not get energy from any other source, which one would you choose? If you choose the PV, you would be able to do a myriad of useful things for a few hours during the day, but be powerless at night. In addition, your energy would be very limited during long cloudy periods and, if you live a good distance from the equator, the winter months are likely to be very uncomfortable. If you choose the coal, on the other hand, you would not be able to charge your iPhone, but you would be able to cook your food and heat your home/water whenever you want. Which is the better choice? Tough one, isn’t it? This is actually a pretty good analogy for our modern society. Fossil fuels are of limited use without the additional infrastructure required to convert them to highly refined forms. For example, 60% of coal and 40% of gas is currently used for electricity generation (with the rest mostly used for direct heating or other industrial applications). The situation is similar for renewables. We can probably get about 10% of our total electricity from wind and solar before we need to seriously start investing in additional infrastructure to accommodate the intermittency. Both these energy sources are therefore of limited use to us without costly additional infrastructure. For this reason, it is much more realistic to define grid parity not as the renewable energy price necessary to compete with fossil fuel electricity, but as the price necessary to compete directly with unrefined fossil fuels. The primary assumption underpinning this way of thinking is that the capital costs and exergy losses involved in fossil fuel power stations are similar to the capital costs and exergy losses involved in renewable energy storage mechanisms. Despite the uncertainties involved, this should be a reasonable assumption. For example, the latest EIA estimates give the capital costs of pumped hydro (currently easily the cheapest energy storage option) as roughly double that of a coal power plant. In addition, the fact that wind and solar power only release energy over a period of decades while fossil fuels can be used whenever desired demands that future renewable energy generation be discounted. Back to the simple example given above, a discount rate is necessary because someone who chose the big pile of coal would be able to make large up-front energy investments in various profitable enterprises while the gradual energy release from solar panels would afford no such luxury. Discount rates of 5 or 10% are commonly used. OK, so let’s calculate the price of solar PV that would be required to compete with coal at a price of $100/ton. One ton of coal contains about 24 GJ of energy. At a 5% discount rate, 24 GJ today is worth 1.53 GJ of solar power per year for 30 years. At an average capacity factor of 15%, one would require 323 Wp of solar PV in order to produce 1.53 GJ of energy per year. Buying 323 Wp of solar PV for the same $100 paid for a ton of coal would require a price of $0.31/Wp installed. This implies that, under these assumptions, installed PV prices would have to fall to $0.31 per Watt in order to reach grid parity with coal. According to this way of thinking (comparing intermittent renewables directly to unrefined fossil fuels), energy from solar PV is currently about one order of magnitude more expensive than energy from coal. Naturally, this is just a rough estimate which will vary substantially depending on many factors, six of which will be further explored in part 2 of this post. However, the central point is quite clear: Objectively speaking, intermittent renewables are still very far from challenging fossil fuels as the preferred energy source of our industrialized civilization. Some tremendous technological breakthroughs will be necessary to change this outlook and such amazing advances, if they are even possible, are likely to require many more decades of basic R&D.